2011 into 2012: Leaving the Old for the New! Welcome to my all new singing and dancing blog courtesy of WordPress! I’ve been struggling along recently, updating my blog on my wonderful new iPad and having all sorts of associated problems using apps designed for Blogger. I’ve now reached the conclusion that Blogger and I will have to part company and so, here I am! Luckily WordPress has made it easy for me, allowing me to import all my posts and my followers comments at the click of a button! All future posts will be made from this new account, so I hope that you follow me and my running stories here. Well, he might as well have done. Talk about falling into puddles right up to your middle!! Grant and I set off to do a slow, steady 4 miles around the parish, a route I abandoned a few months back because every time I went on it it was flooded. Ah, yes, that’s why I didn’t run it. Hmmmm. It’s a great route; really nice views, quiet and fairly taxing (a few nice hills to get the blood pumping). We’d covered a mile and half when first of all my supposedly fully charged Mr Garmin started to crash. Then we encountered a puddle of truly Biblical proportions which, as we hadn’t thought to bring the ark with us, we had to try to tip toe around, taking to a farmyard at one point. Wet toes already. Having passed that we headed downhill and, as Mr Garmin slowly died on my wrist, I tried to gauge our run:walk intervals by the colour of my husband’s face. The wind picked up as we headed along the long straight, blowing straight into our faces. It was half refreshing, half hard work. As we reached the end of the straight I knew there would be another flood across the road. Indeed there was. We hadn’t even reached 3 miles and we’d hit two massive puddles and somehow managed to keep our feet reasonably dry. We chatted all the way round, which was great. Normally I would have the iPhone for company, but I’ve taken to leaving it at home on runs with Grant, which isn’t always a great thing as having the iPhone means that I have a back up to the Garmin if it isn’t as charged up as I would believe! We’d done 3 miles and we had to turn under the railway line and run up past the church to get home. I’d been giving Grant landmarks to reach for his walk breaks and one of the last ones was “to the bridge”. We turned the corner and stopped dead. The road was totally flooded. From side to side. No path, no grass to tip toe along. Just wall to wall water in a dip in the road. I went first. I tried to keep to the edge but it became immediately clear that the water was deep. As it reached my mid calf I just went for it. My shoes were full, my socks were soaked and my leggings were clinging to my legs! Grant followed me through, a little reluctantly! We had less than a mile to run, but a mile to walk! Totally soaked I said “Right, come on – let’s get on with it!” I even made him run the last hill, despite protestations! We completed the 4 miles in around 48 minutes (taken from our start and finish time) which gave us 12 minute miles at a steady pace throughout. A few of those mixed in with some treadmill interval sessions will put us in good stead for the Great Winter Run in a couple of weeks. Let’s hope for snow, ice, wind, hail – anything. Just no puddles!! The big day has passed, but I thought that some of you might be interested in what I cooked for my Christmas lunch as someone who avoids wheat, nuts, meat and fish! Most people can’t see past having turkey at Christmas; I can’t ever imagine having something die just to feed my own gluttony, but each to their own. I’m not a preacher, I don’t set out to convert anyone, although it amazes me how many people tell me that they hardly ever eat meat once they know that I never eat it! This year my husband, a determined meat eater, decided to join me so that we could have a totally meat free Christmas. He didn’t quite last all day, bless him, but our lunch was completely meat free. We researched the menu quite a lot before the day. 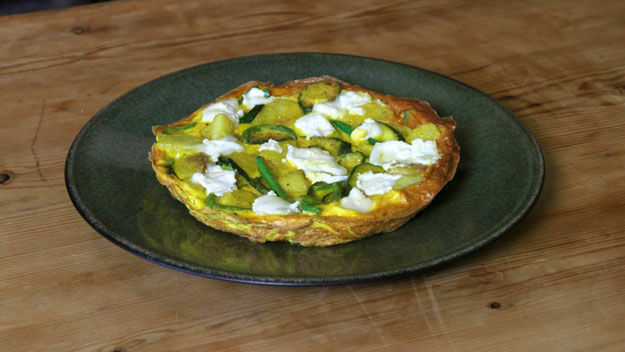 In many ways eating a traditional dinner is an easy option. It doesn’t really call for a great deal of thought; it can just be the same old, same old. We needed something that was nut free and wheat free as well as containing no meat, but we needed to think about the entire meal with flavours that complemented each other. We love Indian food – it’s very veggie and gluten free friendly. 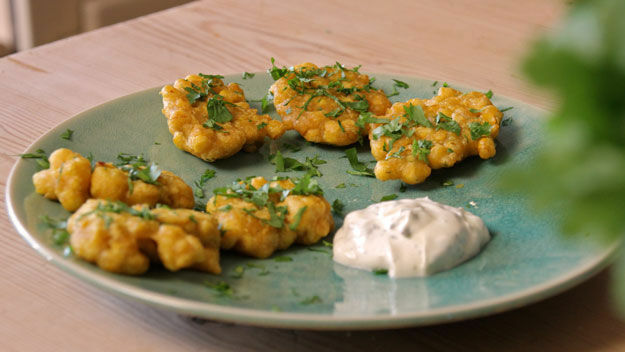 Once I’d sourced some gram (chickpea) flour in Dumfries we decided to make our own pakora as a starter. We followed HFW’s recipe for cauliflower and sweet corn pakora. They took a while to cook as we had to fry them in small batches, but stayed crispy in the oven and were totally delicious. Thankfully we made a truck load so I have plenty for today and the next day etc etc. To accompany the main I found two potato recipes using an app called WholeFoods; smashed potatoes with crumbled Stilton and oven roasted potatoes with thyme and rosemary. Both were delicious, totally different to each other. Finally I honey roasted fresh carrots. The combined flavours were astonishing, nothing too rich, everything subtly bouncing off each other dish! To those of you with the imagination to look past using meat or fish in every meal, please have a look at these recipes, I can guarantee that you will fall in love with something!Merry Christmas! Yesterday saw my last run before Christmas. I realise that Christmas is still almost a week away, but tomorrow I have to go into hospital for a small operation and I’ve been advised not to run for a few days afterwards. It will be nice to save my next run out for Christmas Day; it’s something to look forward to. 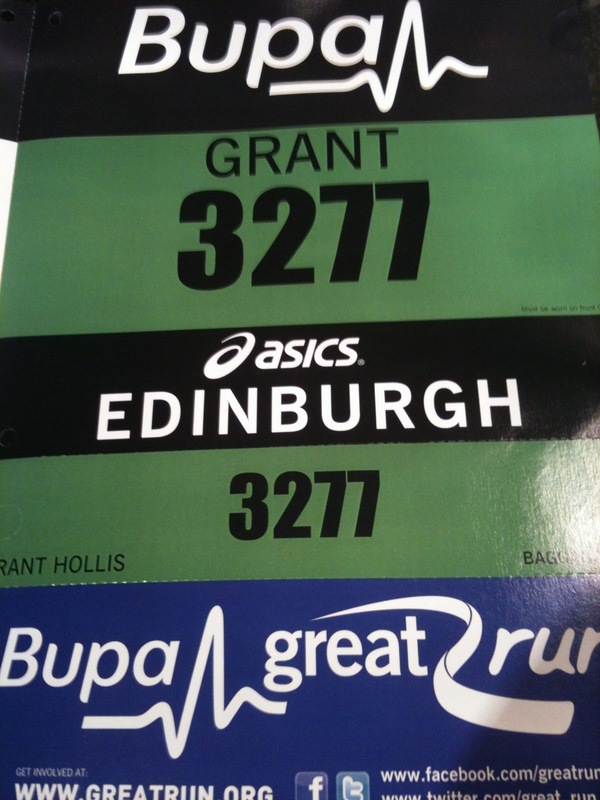 This last week saw our race packs arrive for January’s Great Winter Run around Holyrood Park in Edinburgh. Although a 5k is water off a duck’s back to me, it’s Grant’s first race and he is understandably concerned about completing the course in a respectable time. I’m not concerned; he runs a steady 11 – 12 minute mile pace and 33 – 36 minutes is a great time for a first 5k. To stop him from worrying quite so much I’ve agreed to do some practice races with him – a series of 5ks before the big day! Yesterday was out first road run in a while. It was a glorious day; clear skies and beautiful sunshine over frosty Dumfriesshire. We were determined to somehow fit our run into our only free day. I had warned Grant that we might run out of light, as we had so much to do, and we agreed to run in the town if that was the case. As I’ve mentioned our village is half a mile long and although it has street lights along the main road doing a 5k would involve a boring 6 ups and downs of the village. No thanks! After finishing our chores it was obvious that we just weren’t going to have the light to run on the road. So we got our kit on and headed into Dumfries, 10 miles away. We parked in Dock Park, alongside the river. I’d previously mapped out the circuit and knew that it was a long lap followed by a shorter one to get the full 3 miles. It was cold and frosty and although we were layered up our warm up walk didn’t really warm us up. I had Jeff Galloway’s Ultimate 5k app running, taking us through a steady 7 minute kilometre pace with music synched to our foot fall. I find it really easy to run to the beat and, oddly perhaps, inspirational as certain songs filled my ears. Our route took us through Dock Park to the new bridge, along the other bank, under St. Michael’s Bridge, up past the old Deer Park, across the Devorgilla Bridge and down the Whitesands to Dock Park again. The second lap took us across the suspension bridge, a much shorter route. As we set off both of us were struggling to breathe. The air was icy and neither of us were wearing face protection. I got into my breathing pattern reasonably quickly, but it was obvious that Grant was struggling to find his. Apart from a few dog walkers the route was extremely quiet. It was also delightful! Running alongside the river with the street lighting bouncing off the water was wonderful. The ground was a bit slippery in places, but not enough to slow us down and, as I pointed out to Grant, the Winter Run is never cancelled, no matter what the conditions. The more ice runs we do the better! Our pace was steady all the way round, although as we started the second lap Grant asked if we could slow down because he felt that we were speeding up. I think he was just tiring, so I slowed down a little. Very briefly! He ran behind me for a lot of the time; whether he was struggling or just enjoying the view, I’m not sure! He wasn’t far behind me and I wanted to pull him along, so I kept the pace up as much as I could. As we climbed the steps up onto the suspension bridge I could see dark figures at the other end. We ran on across the bridge and were greeted by screams as the folk we went bouncing past grabbed onto ropes in order to steady themselves! I shouted an apology and we listened to them laughing as we headed off the other side. There were no splashes so we hadn’t caused too much harm! We had to stop a couple of times on both laps to cross the road on the St. Michael’s Bridge end but finished our 5k in 36:08, a very respectable time indeed! After a cool down walk we stretched out and then headed home. If we can do the Great Winter Run in that time I’ll be delighted. I suggested to Grant that we maybe do some longer runs, maybe at a slower pace, to build up his endurance and also give him the confidence that he can easily run 5k. For all we had a 20 mile round trip, I really enjoyed this run and I can see us tootling into town again to do more routes there. Now that I’ve “done” a half marathon, albeit a solo effort, I need my next challenge in order to keep me out there training. All too easily I could slip into being a jogger, running at 12 and 13 minute mile pace alongside my husband – content to just jog. I have nothing against joggers, but I don’t want to be one. I want to be able to say that I run at a respectable pace for anyone, not just a 47 year old who only started running last year! I’m comfortable running at 11 minute mile pace over distances up to 14 miles (my longest run ever) using the Run:Walk:Run system. What I would like to be able to do is run a 5k in well under 30 minutes and a 10k in under 60. So I need to do some speed work. In the summer I trusted Jeff Galloway and all his running experience and his wonderful injury free running system to guide me to a sub-30 minute 5k. On the treadmill I managed 29:08 minutes, in a race I managed 30:12 and really that was the last time I tried any real speed work. Everything since has been about endurance. I’ve got a 5k coming up in the new year, the Great Winter Run in Edinburgh on Saturday 7th January. 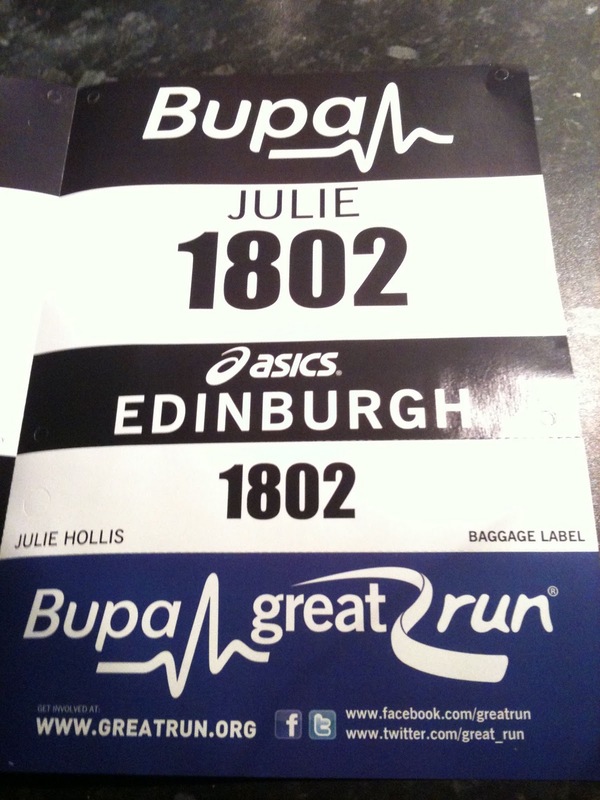 I was meant to do this race last year, and it would have been my first, but I was ill with IBS and unable to run. The kind people at Bupa not only deferred my entry, but also transferred my entry fee as I hadn’t realised that deferring simply meant getting a guaranteed entry to the next race. Really I should be getting my speed up for this race, but I’ve also entered Grant in it and we will run it together. He can easily run 5k now, in fact our last 5k run was off-road and we did it in 36 minutes after a lengthy break for him from running. We should do this race in about 33 minutes without pushing it too hard. I’d like him to finish his first race comfortably and happy. My husband’s happiness means everything to me and it’ll also mean a lot less whinging and moaning afterwards! So anyway, back to my training. Last night I resurrected my Ultimate 5k app from Jeff Galloway (now renamed Easy 5k if you’re looking for it). The app is adaptable to your profile (height/weight/age/gender), but also your pace. Last time I was working on a 6.8 min per km pace. I tried the app set at 6.2 min per km last night…for about 5 minutes! I know that it doesn’t sound much, but after all this endurance stuff I’ve been doing, running fast is not what my wee legs want to do. The treadmill was set at 12.2 kph and it was just a little too fast for my first run. I turned the speed down on the app slightly and it adjusted my treadmill speed to 11.3 kph, which was my 5k speed in the summer. I really can’t remember what I started off at before, but I must be starting off faster now as, when I finished the run, Jeff told me that that as the end of my “easy” run. Easy run my a*se! I think I might need to do that run again before looking at speed intervals – I’ll see how I go. I’m feeling no tightness in my legs at all, but my asthma is playing up. When I was running I noticed that my chest was tight and that I was wheezing. I tend to wheeze in cold weather and the studio was cold as we don’t heat it anymore, but this morning I feel as if I have a weight on my chest and I am coughing a lot, a sure fire sign that I’m not getting enough of a breath. I have a chiropractor appointment tomorrow morning and it always helps to loosen tight chest/back muscles. If that doesn’t do it I may need to get an inhaler for the winter. I haven’t had either the emergency or the preventative inhaler for ages, but I am asthmatic and I can’t just stop being that! Cold weather exacerbates it. In the meantime I am starting my core strengthening exercises on the days I’m not running. My gym has a stability ball, a yoga mat, a skipping rope and a resistance band as well as my treadmill, plenty of equipment to build up muscle strength without paying a fortune at the local gym! As I’m a determined person I will get into a routine and stick to it. My stomach is my weak spot. I know it, I can see it and so can everyone else. I’m sick of having those questioning “Are you pregnant?” looks when I’m sitting down! The Mother’s Apron has to go! If you are interested in my last few runs, click on the DailyMile widget to the right of the page. I won’t bore you with the details because they aren’t that enthralling, not like some of my other friend’s stats are! Lastly a big thank you to everyone who donated their hard earned cash to my charity fund this year. I started raising money for Alzheimer’s Scotland this time last year and have this week reached the target of £300. On top of that this year I also raised £144 for Cancer Research UK, tripling my target! 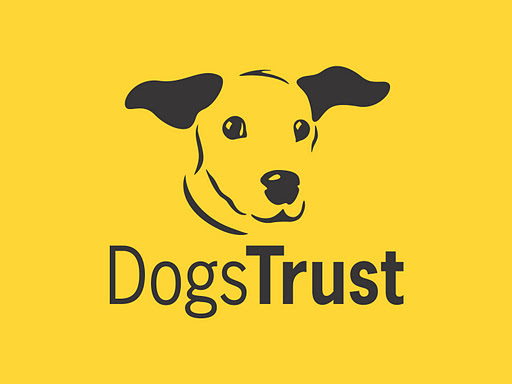 In 2012 I will be raising money for The Dog’s Trust, hopefully running the Great North Run on their behalf, although I am still waiting to hear that I am on their team. The Dog’s Trust is special to me because they won’t put a dog down if a home can’t be found for it. The money they raise helps to find new homes for those that they can rehome and forever homes at kennels and with foster families for those that they can’t. As a dog lover I can’t think of a better charity. However, there is another charity close to my heart which will also benefit from my running in 2012. Pawing is run by my brother and sister-in-law and “provides shelter, care and veterinary treatment for a small amount of unwanted/mistreated animals, and also supports any small charity that exists to directly and legally help animals and work to raise funds not only for rescued creatures, but also for sanctuaries, groups and individuals.” I’ve seen first hand the care that these animals receive, mostly in the home and garden that my family have basically turned over to the care of these animals. Anything I can raise to help with the costs of running a small charity like this will help them to provide food, shelter and veterinary care. Please help me to help them to help the animals they love.